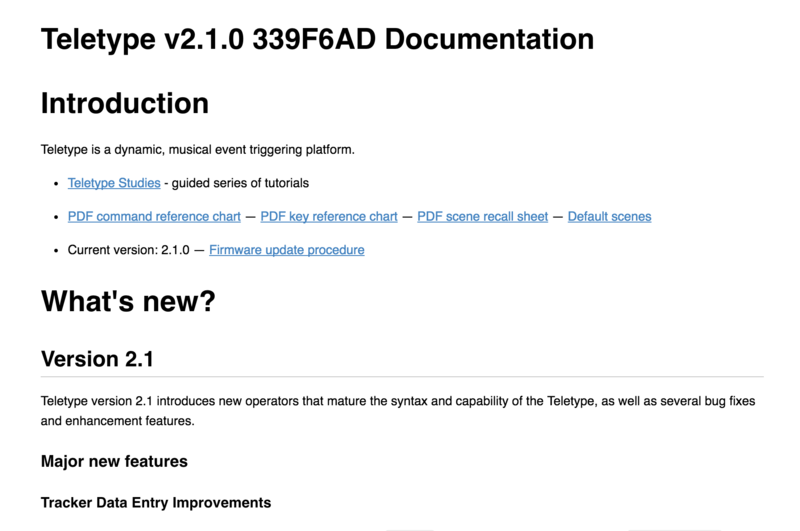 updates both docs (html/pdf) and cheatsheet to include version in the title. I didn't run clang, but the c changes are so small I can't imagine a formatting issue snuck in. 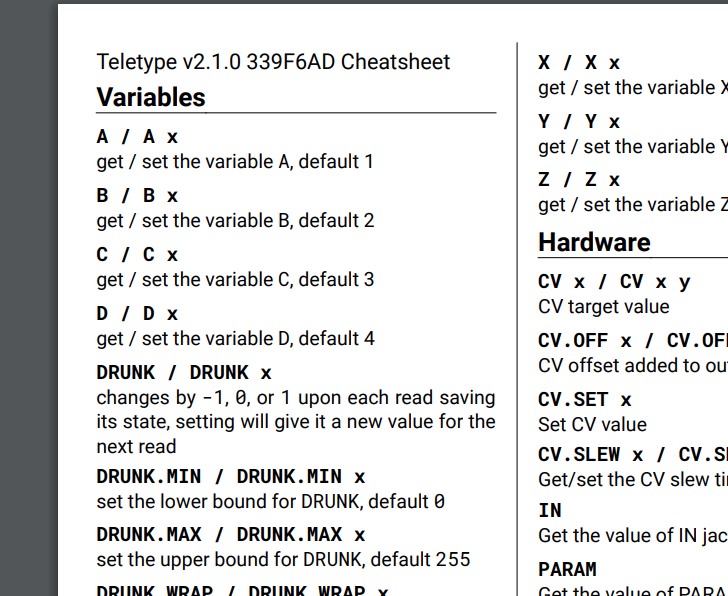 I conformed to pep8 using flake8 for all the python code. @samdoshi There seems to be a few f"..." strings that were getting picked up as invalid syntax from running flake8 on the commandline as well as with the atom package I downloaded...I didn't edit them, didn't see any error output when running the docs make commands, and couldn't not figure out what it thought was invalid about the syntax. Let me know if there's something I can do to get those to go away. I'm mostly happy with the code, but the makefile gitversion.c command is really long, and I am not bash-savvy enough to figure how to cleanly break up into multiple lines. If anyone has any suggestions there, paste what it should be and I'll gladly change it! @tehn if you wouldn't mind waiting to merge until @samdoshi has a chance to checkout the python stuff I'd appreciate it...he had some suggestions via PM that I want to make sure I did like he wanted. The only thing I would tweak is the string VERSION to something more obviously a template variable (e.g. $VERSION$). 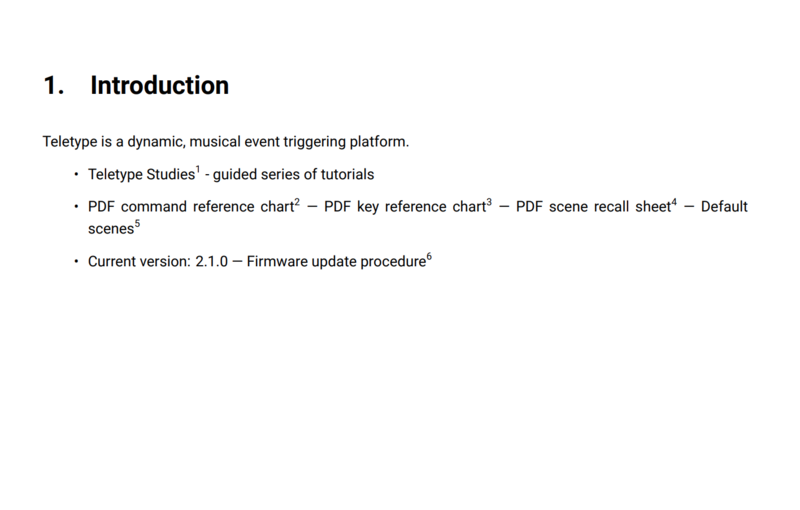 If it's okay I'm going to make a few tweaks to the PDF versions once this merges (I might have an experiment with headers and footers). I can make the VERSION change at the same time or you can in this PR. I'm easy. Let me know. @samdoshi done! (sorry about the two commits...did this from the web editor). If this looks good to everyone else/you @tehn, feel free to merge. Let's leave this be until we figure out the 2.1.0 squashing stuff. I can rebase if need be. If you wanted to rebase this and force push, that would be welcome. Just to stop the network graph looking quite so bonkers. If not, it doesn't really matter, just let me know either way. Yep I can do that this afternoon...or you are welcome to if you need this to get done work done today. On Wed, Oct 18, 2017 at 6:29 AM Sam Doshi ***@***. ***> wrote: If you wanted to rebase this and force push, that would be welcome. Just to stop the network graph <https://github.com/monome/teletype/network> looking quite so bonkers. If not, it doesn't really matter, just let me know either way. — You are receiving this because you authored the thread. Reply to this email directly, view it on GitHub <#116 (comment)>, or mute the thread <https://github.com/notifications/unsubscribe-auth/ABR8oEX8XDwfuqZ7K5BUIx1tt23YSzuPks5stdL3gaJpZM4P5MvT> . @samdoshi whoops--forgot about this. I just rebased so this should be ready to go. @samdoshi @tehn I think this is good to merge. If you don't get a chance, I'll merge it on Monday and submit a PR to tweak it and a few other docs related changes I want to make late in the week. ok looks like this is going to need rebasing against the 2.2 which i just merged. i apologize for the delay, should've gotten this in sooner. that said, it's a pretty minor conflict. @tehn happy to rebase agains 2.2 sometime this week, thanks for following up on this.